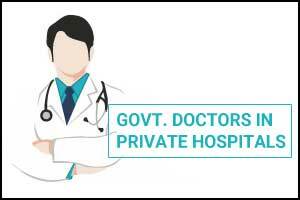 Srinagar: The Doctors Association Kashmir (DAK) alleged that that private hospitals in Kashmir valley are being run by government doctors, who take salary from public hospitals and set up their own independent practice. “It is ironical that full-time government doctors are allowed to run private hospitals depriving poor and underprivileged of essential health care,” DAK President Dr Nisar ul Hassan said. He said doctors concentrate their attention and work effort on private practice at the expense of public hospitals. They use public hospitals as recruiting grounds for their private practice and orchestrate scenarios to generate business for their clinics. “The dual practice creates a pervasive incentive for doctors to increase waiting times at government hospitals so that patients are forced to go to private clinics,” he said. Dr Hassan said patients in government hospitals are left to the mercy of trainees who lack expertise to handle complicated cases. “Patients die of misdiagnosis or delayed intervention due of non-availability of senior doctors who, most of the times, are in their clinics,” he added. Dr Hassan said allowing private practice is against the regulations of MCI that are mandatory by virtue of law adding that various committees from time to time have called for ban on private practice of doctors. “Even the courts have observed that the academic character of health institutions gets damaged and the profession of health care gets affected by dual practice of doctors,” he said. The previous attempts to ban private practice of doctors have been stalled by a strong lobby and they have misled regimens on the issue. “The rulers of health care should draw a line between private and public health sector and doctors should choose one sector as they cannot work on both sides of the divide,” he said.